While commonly confused, the differences in meaning matter! The English language can prove tricky, even to native speakers, and listeners often find three similar-but-different words jarring when misused in conversation — particularly if a grieving listener hears the incorrect term at a funeral, burial or memorial service. 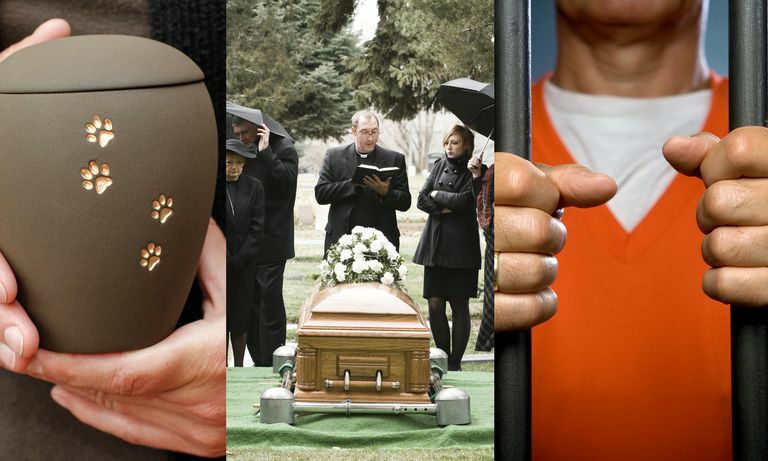 This article offers the definitions for inurnment, interment, and internment, as well as the crucial differences between these commonly confused words. Definition: To place the cremated remains of a deceased human being or animal into an urn*. While you might suspect that "inurnment" is a relatively modern term formed by emulating the word "interment" because of the increasing popularity of cremation, the use of "inurnment" in the English language actually dates back to the time of one of William Shakespeare's most famous plays, Hamlet. Published in 1602, the ol' melancholy Prince of Denmark himself uses the term when asking the ghost of his dead father why it's wandering around when he and others previously "saw thee quietly inurn'd" (Act I, Scene IV). That said, the use of "inurnment" in English undoubtedly increased in the second half of the 20th century when cremation as a form of final body disposition started to gain acceptance in the United States. *Today, the English word "inurnment" generally refers to placing cremated remains or "ashes" into an urn, but in some cultures, such as China, it is not uncommon to disinter the deceased's non-cremated remains from a grave site after five years and carefully pack the skeletal bones into a large earthenware urn. Technically, this constitutes an inurnment, and the author personally witnessed such a ceremony in Hong Kong in 2008. Definition: To place the remains of a deceased human being or animal into the ground, e.g., earth burial**. The English word "interment" arose sometime between 1300-1350 and is commonly used today by funeral service and cemetery professionals alike, as well as the public. Part of this word owes its genesis to the Latin word "terra," or "earth" — which also gave rise to our English words "terrestrial" and "terrace." **Because of its linguistic origin, the English word "interment" usually refers to the burial of human or animal remains below ground, but this is not a requirement. While more common in the past, many individuals were "interred" in a sarcophagus, mausoleum or tomb above ground, and it is even correct to say that "a cremated individual's inurned remains were later interred," whether below ground in a gravesite or above ground in a columbarium niche. Definition: To detain or confine a person/group of people viewed as a threat. People arrested for committing a crime are subject to "internment" — or, in the common vernacular, they are "tossed in the slammer." If you remember the significant difference a single "N" can make between "inter" and "intern," you likely will never again forget why someone mourning the death of a loved one might bristle when hearing a relative or friend say, "Yes, her father was 'interned' this morning." "Interment." Collins English Dictionary — Complete & Unabridged 10th Edition. HarperCollins Publishers.